Salve making is therapeutic in a sense. Not only are you creating something so pure, so natural, and so effective for your physical body but the process of salve making is somewhat emotionally healing as well. I am not sure if it is the herbs you are in contact with, the rhythmic flow of melting and stirring, mixing and pouring. All I know is that after a salve making session, I feel reinvigorated, relaxed, and renewed. Everyone is capable of making simple salves. If you are already a real foodie, I guarantee that you have all the tools you need in your kitchen. There is not anything fancy involved. Even if you are not a real foodies, the ingredients to make salve are all readily available and again, probably already hanging around your pantry. I am sure that you are curious about what exactly is in this book. I have shared the Table of Contents below so you can get a better feel for the book. In short, I give you some basic background information but then I turn you loose with my very easy recipes. 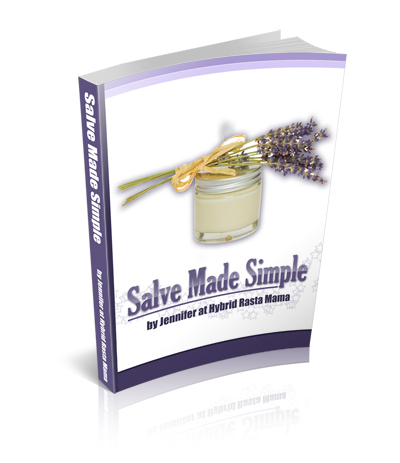 I wanted to keep this eBook short and to the point, focusing on the must-have salve recipes, the ones that you will likely need in your family.